MEGADETH bassist David Ellefson has confirmed that the band is contemplating returning to the studio at the end of the year to begin work on the follow-up to 2016's "Dystopia" album. The Dave Mustaine-fronted band recently toured North America with MESHUGGAH and will play arenas this fall as the support act for German hard rock veterans SCORPIONS. Speaking to RAMzine at this month's Bloodstock Open Air festival, Ellefson said about MEGADETH's plans for the coming months: "We've got a run with the SCORPIONS. Double headline tour across [the U.S.]. A lot of big places. And we were going to finish up in South America in October/November. Those dates have been announced now, and then after that we are talking about getting started on the new record." Asked what the next MEGADETH album will be like, Ellefson responded "We can talk about it all we want, but we won't know until we get in to the studio. The feeling is that 'Dystopia' re-calibrated MEGADETH. We've been touring a lot with this lineup so now we are going in to it feeling like a band — that is an actual band. It will have a lot of character and personality passed on from the four of us. At the end of the day… it just needs to be MEGADETH." 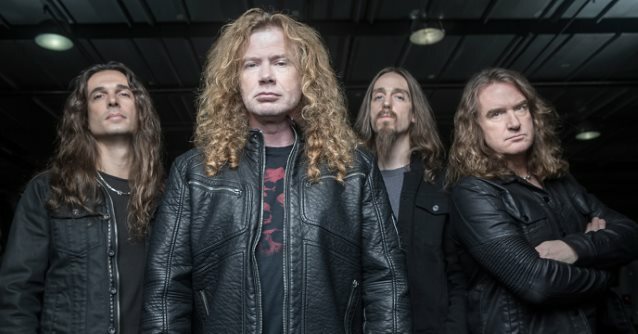 MEGADETH's upcoming effort will mark the band's first release to feature new drummer Dirk Verbeuren, who officially joined the group more than a year ago. "Dystopia" was the first album to feature Brazilian guitarist Kiko Loureiro, best known for his work with ANGRA. Asked if MEGADETH's current lineup feels like a new band, Ellefson said: "For me, it feels like a new band. Yet there's still a benchmark everyone has to rise to — me and Dave [Mustaine] included. And I feel like we have exceeded that. Which is cooler, because we don't just get to be the MEGADETH of the past but of the future."